Meet the hardworking MrSethi, who usually stands at the cash counter but also marinates the chicken, slices onions and manages the workers. 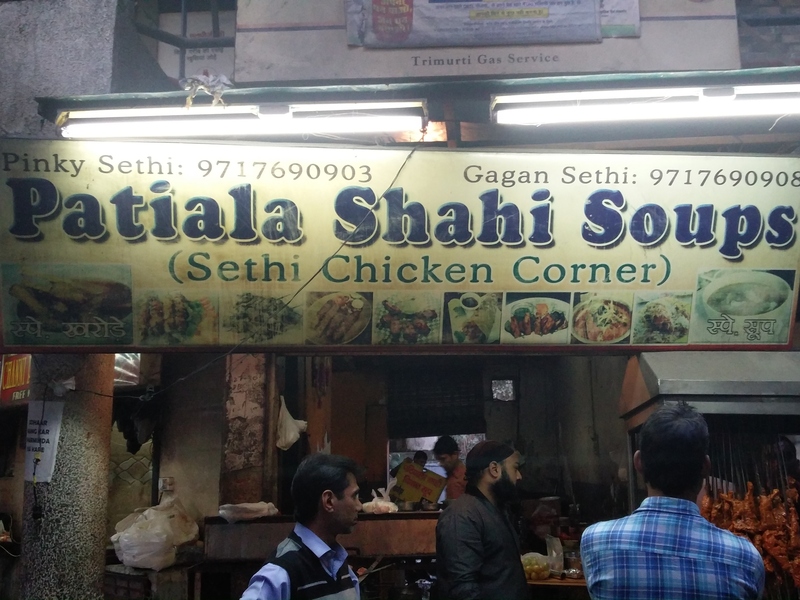 Mr Sethi told me told me that originally they used to sell only soups but now they have added more items to their menu. The journey started by the current owner’s father on a wheel-cart has now reached to a proper shop, where delivery and takeaway options are alsoavailable. But there isn’t a much place to sit. You’d find a few plastic chairs and tables but they are very less in number and stray dogs will roam around you if you eat there. People (usually males), in the evening, would often come here and eat. Also, they covertly drink there. So, I tried their Chicken Soup, Kharoda Soup (Bone Broth), Tandoori Chicken and Keema Chicken. The onion salad that they give along with the food has a lot of cream in it, and like I’ve mentioned above, he called that cream-green mint chutney-onions as their speciality. I could believe that since many people were actually asking him to give onions with extra cream; his USP I’d say. SO coming onto the chicken soup – it was thick, and had too many flavours. I could feel the corn-starch used to prepare the base of the soup and along with it many spices were added. It had a tangy taste and shredded boiled egg whites, Paneer and shredded Chicken were added in it, while the bread croutons were added while serving the soup. It was spicy, and tasty. The Kharoda soup was hot, in terms of the spices added to it. Red chilli powder, Garam Masala powder and green chillies made it a tad too spicy for my palate but it was definitely worth having. The owner told me that they have been selling these soups for about 25 years. It’s only 6-7 years ago that they have shifted to a shop. Tandoori chicken was roasted to perfection, neither too much nor too less. I asked him about the ingredients he used for preparing the marinade for chicken but he was apprehensive about telling it. From what I could tell from ‘reverse-induction’ method or by tasting, the chicken’s marinade definitely had yoghurt, hint of garlic-ginger, red chilli, Garam Masala, with black pepper on the higher side and food color. When the chicken was roasted, lemon was squeezed over it and was garnished by chopped Green Coriander leaves. My experience says that mostly all such eateries/eating-joints manage to prepare such ‘dry’ items pretty well but the gravy items act as the differentiator. I finally got to taste the Keema Chicken. I had high hopes with this but to my surprise it looked a bit yellow (most probably because of the extra usage of Turmeric powder). The taste was not as good as I had expected. It had too much of tomato and ginger in its gravy’s base and less of onion and garlic. The spices were mild in this one. The gravy was thick and the chicken used to prepare this dish was semi-roasted. I had this dish with Rumali Rotis, which they brought from somewhere else. My final verdict would be that this place is worth going but only to have soups and dry items (appetizers). For main course (gravy) items, this place doesn’t have much to offer in terms of quality and taste. It’d be best to take-away your food or to get it delivered at your place (only if you live in VikasPuri).